It’s always interesting when historically opposing forces–or, in this case, public figures that represent those forces–suddenly come into alignment, for no obvious reason. In this case, Scottsdale mayor Jim “Shady” Lane published a letter in the Scottsdale Incompetent, in which he praised new Scottsdale Unified School District superintendent, Denise Birdwell. 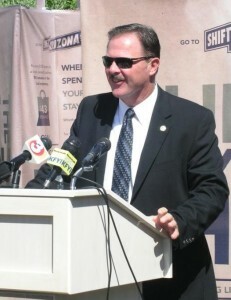 Lane is probably the most anti-public education politician in the history of Scottsdale. One of his major supporters is Steve Twist, whose son, Eric, is a senior officer with the Great Hearts publicly-funded, private charter school chain. Go figure where Lane gets his marching orders. Lane and the Twists and are all closely tied to Arizona governor (and anti-public education disciple) Doug Ducey. Birdwell came in to SUSD on the cusp of a major bond (read “borrowing” to be paid back by raising property taxes), and is hard at work spending that money via no-bid contracts and marginalized community input. Over a quarter of a BILLION dollars’ worth of construction and reconstruction is underway, with very little attention paid to causes of dwindling enrollment that will further exacerbate SUSD’s over-capacity problem. How does that play into the hands of favored charter schools? One clue is the past efforts of Ducey-ite Pam Kirby (who currently occupies one of the seats on the SUSD governing board) to spin off that excess SUSD capacity (i.e., unused buildings and/or campuses) to charter schools. It will be great for the taxpayers to spruce up old SUSD real estate before they hand it over to the Friends of Lane! You can hardly be the most livable city, or one of the happiest cities in America, if you are not providing opportunities for people. One of the surest ways to cut off opportunity is to have less than a top-notch educational system available to our students and their parents. Though the city has no responsibility for the school district’s governance or educational performance, we entirely understand that when it comes to Scottsdale Unified School District schools, the largest providers of education in our city, our community depends upon the elected school board. They are elected to ensure the best possible management of resources and talent to deliver the best possible education experience, environment and outcomes for our children. SUSD Superintendent Dr. Denise Birdwell was hired by that school board to replace the previous superintendent, Dr. David Peterson, who left under some cloud of hostility in his performance review. Among Dr. Birdwell’s immediate priorities was an independent assessment of the weaknesses perceived by the board in SUSD’s structure and educational system processes. Dr. Birdwell’s educational and management credentials, along with her extensive experience and her reputation for leadership, made her the right candidate for the job. The complete turn-around of Higley Unified School District a few years ago is a prime example of her ability to combine students’ educational achievement with managing the educational process for positive student results. Dr. Birdwell has worked with the community. She has engaged parents, students, teachers, ASU’s Mary Lou Fulton Teachers College, Scottsdale Community College, businesses and educational organizations in conversations to evaluate the current situation and to propose remedies to correct any shortfalls identified. This sort of frank assessment is never easy. There will always be pushback from the long established status quo in circumstances such as this, but I personally have never been more confident or encouraged of the direction SUSD is moving. There is hardly any greater area of importance in our city than our schools and the opportunities they present for Scottsdale’s children. This letter confirms my full support for this effort and how it is being tackled. I wish Dr. Birdwell and the school board the very best in their efforts, and encourage everyone in Scottsdale to constructively engage in this critical process. I love how you paint them as anti-public education. I think the more correct description would be pro-parental choice. Do you also describe pro-life voters as anti-choice? I parse not thy conflation.